In the Southeastern U.S., barbecue is barbecue is barbecue and that barbecue is PORK. There is no dispute around here that real barbecue is made of pork and pork alone. The hotly debated contenders include: cooking styles, serving methods, side dishes and sauces. I will not pass judgement as to which one is "best" but I will say this: The first barbecue you eat is the one you will always think is best. 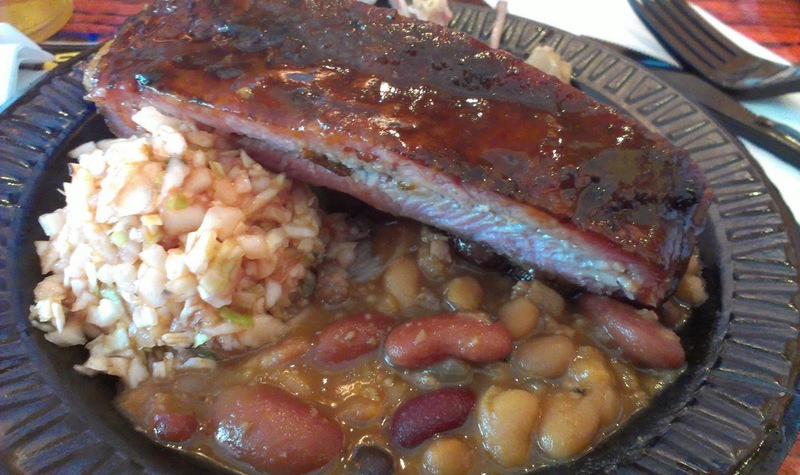 Barbecue imprints itself on you at birth and you will eschew all others. You may taste, sample and try others, but none will hold a candle to your first barbecue love. Mine? Lexington-style. (Note: Lexington-style is a vinegar-based sauce that is seasoned with ketchup, vinegar, black pepper and other spices. Only the pork shoulder of the pig is used). Spring is here but Mother Nature doesn't know it. It's hard to get in the mood for Spring, Summer, barbecue and cookouts when you are wearing a scarf and fur-lined boots to work every day. I'm going to try to break the mold and highlight some warm-weather foods. 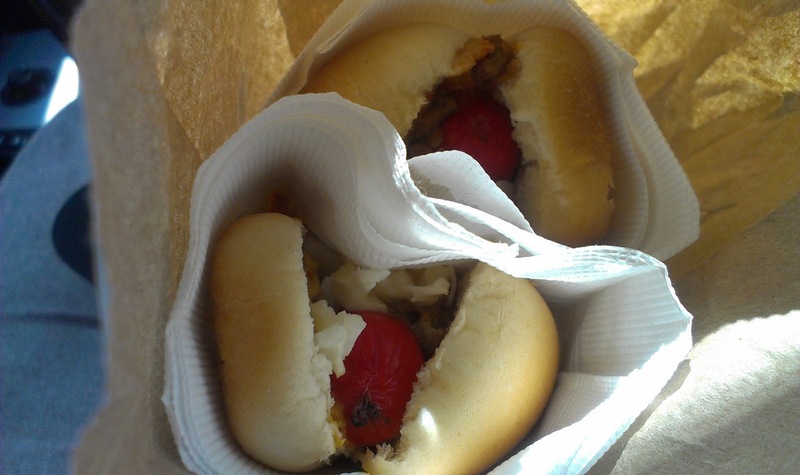 First, here are some hotdogs from 103-year old J.S. Pulliam Barbecue in Winston-Salem. Every Day With Rachael Ray magazine said these hot dogs were the best in the South in 2011. These hot dogs are the quintessential red hots with a bun that is perfectly toasted on top and buttery. When you bite into it, your teeth meet the meat of the hot dog with complete aplomb. The only way to get this kind of dog is ATW (all the way). The stripes of ketchup and mustard collaborate with the fresh chopped onions and dance with the creamy white slaw and the crown of dark, tomato-tinged chili all work really well together. Next, The Bahnson Burger from Spring House Restaurant in Winston-Salem. A behemoth of a burger, finished with ham, pimento cheese, and crispy onion rings, this sandwich leaves nothing to the imagination. Look at it. I had to dismantle the burger to make it manageable for my mouth. Not for the faint of heart (or belly), the cheese slides all over the meat patty and the ham sits proudly on top of THAT. 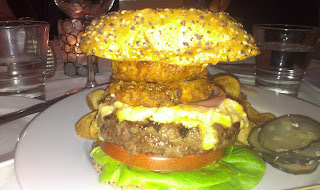 Juicy, meaty and everything you want in a burger at a fine dining restaurant. Knife and fork are optional, but should be mandatory. Last but not least, I bring you BBQ chicken from my grill at home. 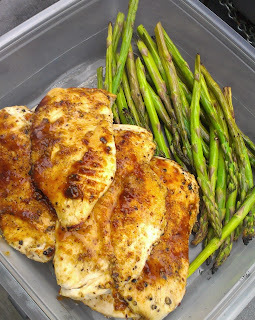 As to not confuse you, BBQ (barbecue, same thing) is still a noun but these chicken breasts get a treatment of barbecue sauce, spices and finished on a hot gas grill. I prefer charcoal for the flavor but I like the speed and convenience of the propane. Speed outweighs the usual low and slow approach of using a grill today. Come back by June 1 and I'll have plenty of briquets to split with you. Before grilling, marinate the chicken for an hour or overnight. You can use your favorite marinade or mix up the marinade below. In a pinch, use bottled Italian dressing. This adds moisture, flavor and also keeps the chicken from sticking to the grill. Pour marinade over chicken in resealable plastic bag; seal bag. Refrigerate 1 hour to overnight. Remove chicken from marinade; discard bag and marinade. Heat grill to medium-high. Season chicken breasts with salt and pepper. Clean and lightly oil hot grates. Place chicken on grill (if using skin-on chicken, place skin side down on grill). Grill chicken, without turning, 6 to 10 minutes for boneless chicken and 10 to 14 minutes for bone-in. Flip and grill until cooked through, or a thermometer inserted in the thickest part of meat (avoiding bone) registers 160 degrees, 8 to 10 minutes more. About 8 minutes before chicken is done, brush with barbecue sauce. WOW look at that burger! mm love the BBQ chicken recipe too. I'm becoming a BBQ fanatic after buying a smoker last month. Figures after I move out of Texas to California I start a passion for BBQ. Anyway nice article and that chicken looks great. Looking for BBQ in California only left me disappointed. Nothing comes close. I did, however, find and try my share of tri-tip. Too lean for my tastes, but that's California cuisine for ya!